We have created the 38 Times Tables Challenge to demonstrate just how easy, effective and fun learning maths can be with great resources. It&apos;s a 3 step activity that will help children towards achieving instant recall of times tables - and truly mastering this important primary maths skill. Originally designed for home use, we were approached by teachers who recognised its potential to help bridge the gap between classroom and home, and to engage parents, so have added teacher resources to make it suitable as a classroom activity also. We&apos;ve built some flexibility into this resource so it can be used in a variety of ways. There are also options for use where the classroom technology is limited. As a complete homework activity: The 38 Challenge was originally made for home use and you can see the home version here. To use it as a homework you&apos;ll need to direct learners (and parents) to komodomath.com/38 Here are some printable homework task slips you can distribute. It may be a good idea to introduce it as a whole class activity before using it as a homework. As a whole class activity: The 38 Challenge is suitable to use as a whole class activity. Step 1 ( the video) and Step 2 ( the practice grid) work well on an interactive whiteboard. Step 3 ( the quiz ) is best used at home as a certificate and feedback is emailed privately to parents on completion. The whole class activity can be enhanced with the printable worksheets for steps 1 and 2 - see the teacher notes below. As an individual learner classroom activity: If you have access to a suite of tablets or laptops you can use the 38 Challenge in small groups or individually. 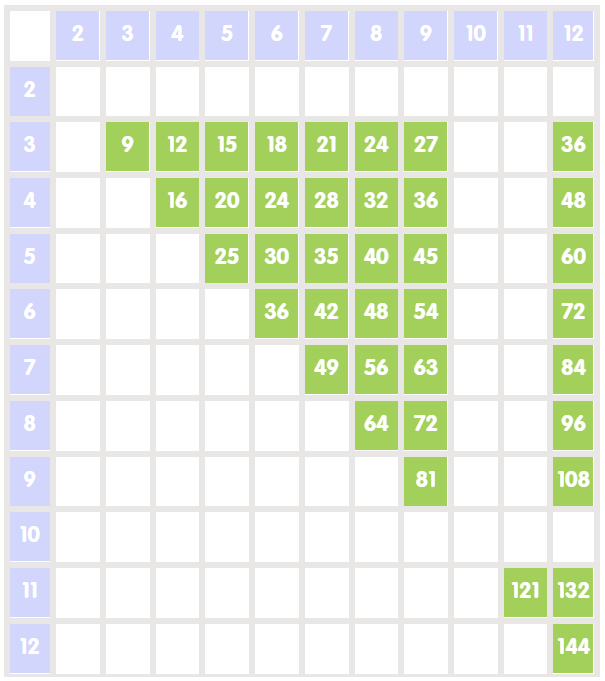 The practice grid exercise can be repeated without refreshing the page. Step 3 ( the quiz ) is best used at home as a certificate is emailed to parents on completion. Thanks for using the 38 Challenge! Feedback is always welcome! If you&apos;d like to be in the loop for more please join our teacher club. This short one minute video demonstrates that when you remove the easy tables and the matching commutative facts, you&apos;re left with only 38 tables to learn. This makes learning tables feel so much more achievable. The video streams from vimeo.com. Since some schools block vimeo, you can download the video in advance. Here is a captioned version. The video conveys a lot of information pretty quickly, so it might be an idea to develop this into a whole class interactive whiteboard activity by using this full complete times tables grid or this blank grid. You can follow the video&apos;s dialogue step-by-step, striking off rows and columns on the grid as you go. The interactive practice grid can be used individually or as a whole class activity on an interactive whiteboard. Completing the 38 in under 4 minutes is a good indication of fluency, however, this will depend on how quickly the learner can input the answers on their device. Note that the practice grid delivers all commutative tables options randomly - so you&apos;ll see 7 x 8 and 8 x 7 appearing in the same square randomly. The practice grid will help you get ready for Step 3 - the 38 Challenge quiz. Use it as many times as you like, until you can complete each one correctly and quickly! Click on the 38 Orange Squares and answer the question. If you can complete in around 4 minutes you&apos;re ready for the 38 Challenge Quiz! The 38 Challenge quiz is a multiple choice quiz that measures how accurately and quickly the 38 times tables are answered. It&apos;s designed as a homework task and is fun and engaging - please give it a run through to see. At the end of the quiz, all learners receive a certificate - here&apos;s a sneak peek and an accuracy and fluency report - as seen here. At the start of the quiz, we ask for a parent&apos;s email address so we can send both the report and certificate to them. Parent and learner contact information is kept private and they can opt out at any time. To begin the quiz, you&apos;ll need your parent to register - this is because we email your certificate to them and let them know how well you have done. I&apos;m Ged, Co-founder of Komodo, ex-maths teacher, dad and founder of Komodo. If you have any questions please get in touch.